The Berbers, my people, live in this day, like in past century,” says Saalah in his sing-song English, which he learnt from watching American movies. The ditty of his speaking voice is endearing, his vocabulary picked up by learning a word a day, from one English-language movie each week. I’m thoroughly impressed despite his misgendered use of pronouns – buy hey, in the vernacular of my gay, male peers, we often refer to each other as “she”. 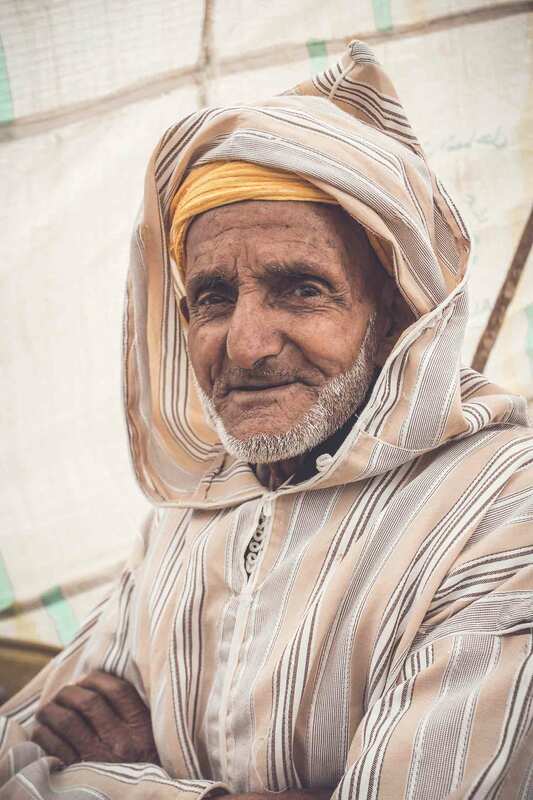 But Saalah trumps me on the language front; he can communicate in Arabic, French, English and of course his Berber tongue – an ancient language in three distinct dialects that now outlives some of the world’s better known classical languages. His knowledge of Hollywood movies is also astounding, verging on encyclopedic. He watches literally everything he can get his hands on and is extremely proud that the latest Mission Impossible movie was filmed on a stretch of glorious, undulating Atlas mountain road just moments from here. His appetite for films is made easier by access to a smartphone, which like everyone in the world right about now remains in his hand throughout the entirety of our meeting. It occasionally buzzes an all too familiar ringtone, ironically interrupting the stories of how his village has remained pretty much unchanged for nearly four centuries. He points out of the ornate window at a hillside settlement on the other side of the valley and tells me that until the 1930s a community of Jewish Berbers lived there. “That’s the only real thing that has changed,” he added. It seems that now, all Moroccan Berbers are of Muslim faith. I take a better look out from the window of the Berber chieftain’s house, now the Écomusée Berbère de l’Ourika. I see ramshackle piles of terracotta, red-mud walls and bricks, literally cobbled together, forming a vertical, multi-tier, honeycomb-like, Mad Max-esque village for the families and community that live here. And by families, I mean both people and livestock. An old man in a cape with a pointed hood nods off under the shade of a corrugated iron roof, his beard as long as his face. He looks like a war-weathered wizard – seeing out his final days, hiding from vengeful warlocks and monsters. Skinny sheep with long tails are bleating loudly, chased by a woman into a garage that is also home to a vintage motorcycle and a cow with voluptuous eyebrows. Chickens stand on the sidelines clucking and laughing, adding to the cacophony, their gossiping interrupted when they notice a bedraggled cat hunting for sport. 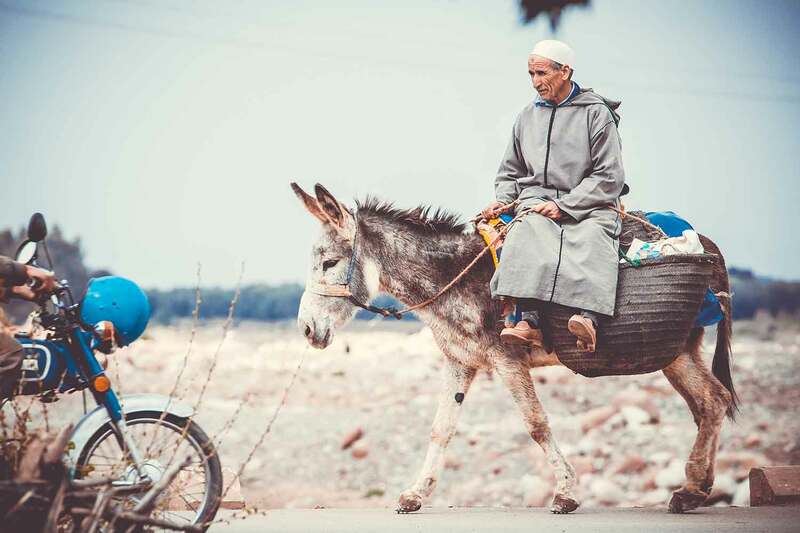 The cat’s attention is drawn to a caricature of a man sitting side-saddle on a donkey, dragging behind him a cart bedecked with a strange collection of groceries – a handful of aubergines, prickly pears and some funky smelling fish. The man throws the cat a sorry looking sprat as an argument breaks out between him and a woman standing on a rooftop, in their millennia-old language, with smatterings of what I vaguely recognise as Arabic because of its more guttural tones. The local potter, whose workshop I visited earlier, rushes to the grocer with an armful of miniature tagines meant for the tourist-infested souks of the Medina – but I can’t imagine the donkey making much haste as a courier though, with Marakkech being nearly 40 kilometres away. The whole scene is positively medieval – if it weren’t for the inconspicuous gleaming of satellite dishes, on each and every building, reaching out the world beyond. Compound the chaotic symphony of Tazfa by a hundred thousand times – and you’ll get Marrakech. 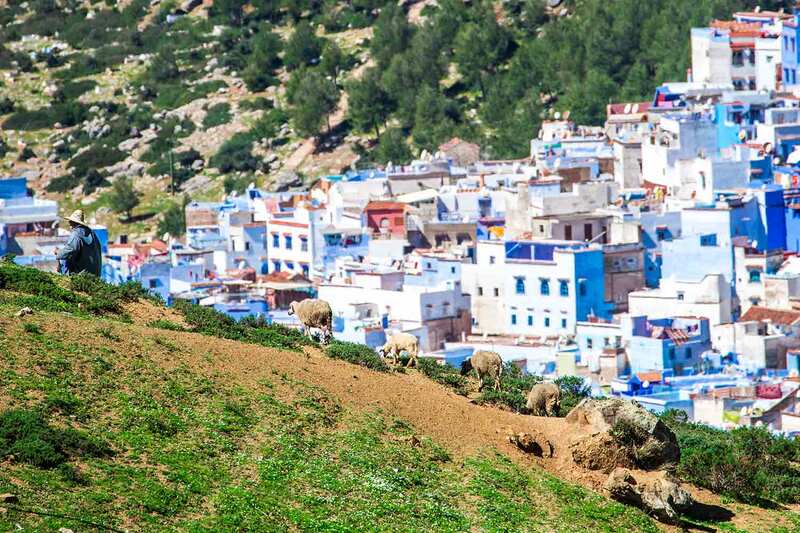 The old-world capital of the Kingdom of Morocco is one humongous Berber village. I had spent the previous day wandering through it – like every other tourist – visiting the souks and exploring the majesty of its exquisite, opulent Madrasas, beautiful palaces and historical mosques. 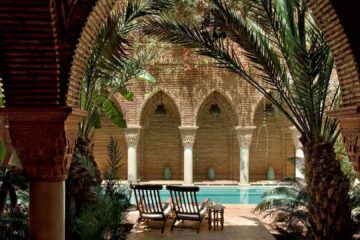 Off the cobbled and pot-holed streets, Marrakech is everything you would imagine and more – centuries of rich history, exquisitely awe-striking architecture and boundless exoticism – a visual and sensory overload, but in a good way. I loved getting lost in the walled city; and even the throng of persistent touts who had offered to show me around or tried to force my hand into buying something were charming in that very moment. The main square of Marakkech’s Medina, Jemaa el-Fnaa is again an amplified version of the scene I’m watching unfold in front of me here in Tazfa, but instead of the chickens and cats, it was monkeys and snakes that contributed to the chaos. And it’s not one vendor on a donkey, but thousands of people on all manners of transport, particularly on foot, all huddled around trying to make a buck in whatever way they can. Musicians and medicine men mingled with sword swallowers, acrobats and magicians. Unidentifiable slabs of meat in carts were pushed through the crowds. People in velour djellabas fashioned into long hoodies went by their lives in the derelict and crumbling surroundings with every square inch of spare space used to sell souvenirs, household wares and other items unidentifiable to a foreign eye. smokey scent of barbecue and merguez sausage filled the air and my eyes. Zesty local oranges being juiced formed a delightful citrusy mist, in contrast to the stench of the unbearably putrid leather tanneries that crept up my nostrils, every time I inhaled. Throughout the day, countless mosques simultaneously performed a sultry call to prayer and the loud throng calmed almost in unison for a split second. The clip-clop of horse-drawn carriages would then break the silence and a chorus of taxi drivers of the ‘grand’ and ‘petit’ varieties, both in their cars and personal statures, call out to tourists with an ever confusing price list, demonstrating the Northern African game of the barter and just how a fare of 500 Dirhams can go down to 50 in a few seconds. I decided last night that I am to have a love-hate relationship with Marrakech. There’s so much to enjoy but like eating a lobster, it’s a lot of hard work – but when you get to the flesh of the matter, you realise why you do it and you’re ready to do it all over again. 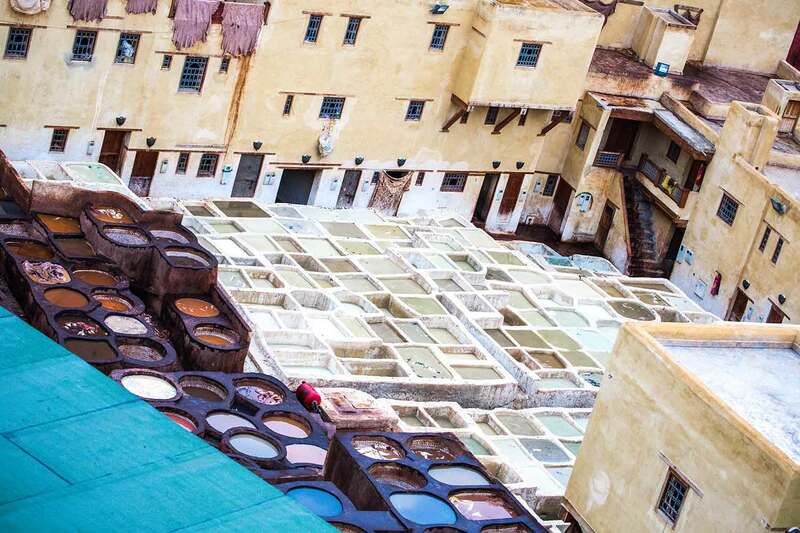 Like the endless mounds of colourful powder in its spice souk, Marrakech has exoticism and mysticism by the sack-load, but equally, you may walk away from the city with a strange, overwhelming taste in your mouth. I do find it rather unpleasant that every visitor is viewed as a walking money-bag. I’m told that the hustlers are never really dangerous, but it seems that they actually enjoy preying on tourists for sport and friendly banter can turn borderline intimidating rather quickly, even to the most seasoned of travellers. I learnt that a firm “No, thank you,” is enough; the best way to get a tout to lose interest in you is to politely get them to understand that there is no way they’re getting any money from you. It’s a matter of simple psychology – if you engage with them, there’s a chance they’ll get you to part with some money. Feign disinterest and they’ll soon stop. But all of this aside, one thing is guaranteed. No one Medina experience will ever be bland and after a few hours, you’ll learn to deal with it and feel its spirit. I actually believe that it shares similar qualities to say, Bangkok, or Calcutta in that way. So if you’re willing to see past the grime and the hustle, there is real energy and a natural authenticity at the heart of it all. Men in sharp, black suits, crisp, white shirts, name tags and Raybans guide their guests from luxury hotels through the village, their SUVs bleeping as they lock up behind them. A van of raucous Chinese tourists pull up – which says it all. A vendor jangles jewellery in my face, a little more perceptive than the children in judging that I’m actually British. He calls out, “C’mon, mate. It’s cheaper than Primark,” (a bargain clothing retailer in the UK). A couple more attempts at a sale proved futile, so he turns to the American tourists passing behind him and tries the same pitch, but with Walmart instead. great willingness to extend the hand of hospitality to passing visitors, something they’ve done for centuries. You see, ‘Berberism’ is not just about where you come from and where you’ve been as a people, but where you are now and what you are doing to exist today. Being a Berber is an ethnic and cultural movement of indigenous nationalism and the survival of that movement is crucial. Thus, it is inherent in their culture to retain long established traditions as an infinitely precious commodity – to be traded and passed on to future generations. Saalah points out the tapestries that adorn the walls of the house. Each tells a story, and Berber women would lovingly weave them to pass on to their children in their transition from adolescents to adults. They’re majestic pieces of art, with each colour and pattern carrying significant meanings – and woven together, they tell stories. 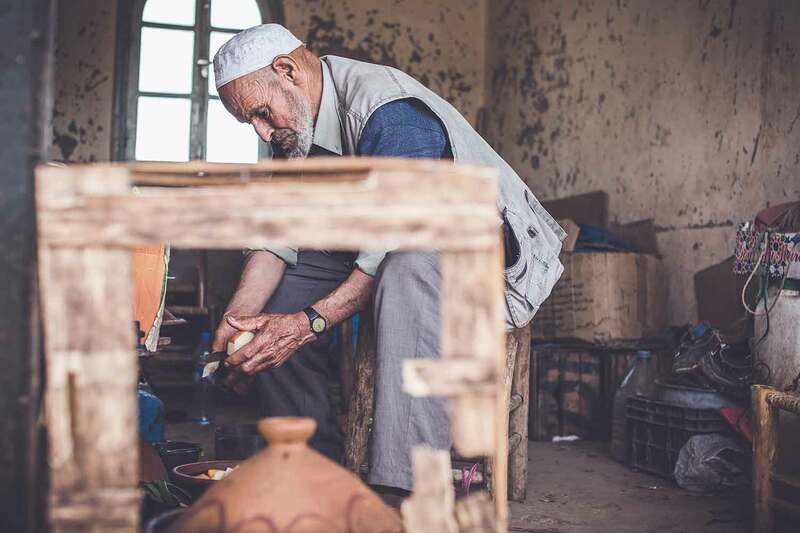 The stories seem to carry a common cautionary tale – that the world of an adult Berber is difficult and sometimes painful, that life throws up many possibilities, both happy and sad. That death is certain. That family means everything. That you must pass on the stories of your past and most importantly, live in the moment. In today’s more connected world, these life lessons become all the more complex. It’s a very common story in such communities and inevitable that even in the most traditional of Berber societies, a modern education has become an important pathway to affluence. 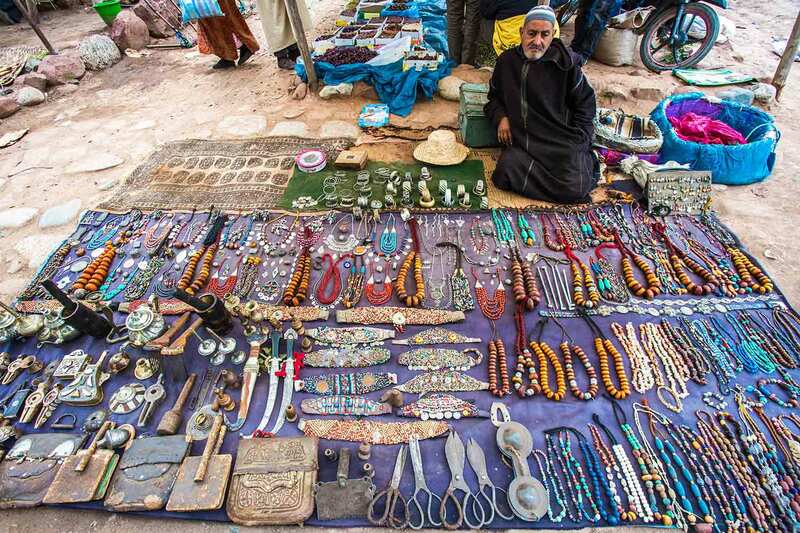 Capitalism, making it big, thriving in the city – what seems on the surface to be very much the antithesis to the natural Berber life order, is one that is increasingly sought after. Our driver and chaperone for the day is another inspiring, self-made Moroccan. Charaf learnt English through his love of hip-hop music, which no doubt accounts for his cool swagger, and streetwise brogue. He spent his teenage years buckling down at school, but when he wasn’t studying, he was writing down lyrics to songs even if he had no idea what they meant. He’d then use a dictionary to work out the meaning, word for word – at first with hilarious consequences as he hadn’t quite realised how much profanity featured in the genre. 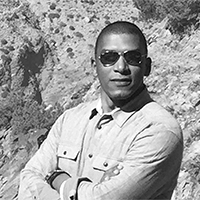 As he grew older and honed his English skills, he combined his love for driving cars with his passion for speaking English by taking tourists on 4×4 adventures in the rugged Moroccan countryside. He became so good at his trade that when the Four Seasons, who have a reputation for being the best at everything, opened in Marrakech, they had to snap him up to be their in-house excursionist. that we do so. It turns out that not many people ever ask him to go off plan and off the beaten track. Just me and Katy Perry, apparently. Charaf takes me to some special, spellbinding spots in the Ourika Valley to help be imbibe in the Berber spirit. 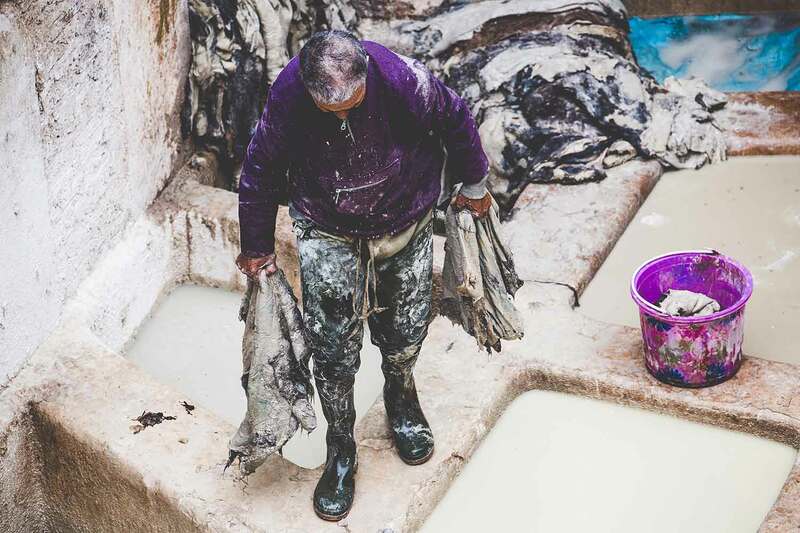 We take in Setti Fatma, a river-side town where after a strenuous hike to enjoy a series of seven waterfalls, we cool our feet in the Ourika river while sipping mint tea, or ‘Moroccan whiskey’ as they call it here. Around us, holidaying Moroccan families from the coast can be seen taking in the waters with us. Charaf tells me that the Ourika is the number one staycation destination for Moroccans from other cities – they too adore the mountains and do all they can to come here. Lunch in a Berber house (tagine, of course) is followed by a long drive. The beauty of the region is almost indescribable, from some viewpoints it’s like the Swiss Alps. From others, it’s like the rolling hills of Wales, or the olive groves of Greece, or the apple orchards of Somerset back home in the UK – all with road signs in French and Arabic. The landscapes get progressively greener and the air purer as we drive. The spring colours of the valley are dazzlingly beautiful. We pass by majestic kasbahs and plenty of wizard-like men herding sheep. We turn off-road to Charaf’s favourite spot, a place that was once, millions of years ago, below sea level. He points out the barnacled landscape to prove his point and picks out a large rock to sit on, as the sun sets in spectacular fashion over the Ourika valley. And just as I think that things couldn’t get more magical, he hurries me back into the car and drives off like a daredevil over the terrain to a slightly lower elevation where we watch the sun continue to dip behind a large lake in an explosion of twilight hues, just as a village mosque calls out a magical Mahgreb. The mountains are calming, spiritual almost. It is so easy to see why the Berbers are really at one with the Atlas. On the drive back, Charaf tells me about some of the guiding Berber philosophies. Collectively, it sums up what being from the Atlas is all about, and the values and culture that its people hold so very dear. That gratitude and happiness are derived from what you have in life, not from that for which you yearn; that you must always treat a guest generously and selflessly; that charity begins at home; that you must always share what you have; to always respect your elders; to treat your neighbours like an extension of the family; and to always have an open-door value of acceptance of others. Beautiful. If only we all came from the mountains. 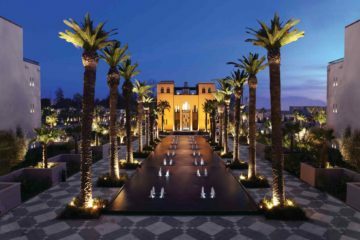 Uwern was a guest of the Four Seasons Marrakech, who arranged this full-day Atlas excursion with their in-house experience team. He also stayed at the magnificent La Sultana. Experience at least a day out in the Atlas Mountains and Ourika Valley to understand what moves the people of Marrakech. Consider staying overnight if you can. There are a range of lovely proper ties, some super luxurious. Keep your wits about you in the Medina. It ’s more frustrating than unsafe, but there’s no point tempting an opportunist. Always negotiate with a taxi driver or get your hotel or riad to do so before stepping into the car. It ’ll save a lot of hassle at the end of the trip. At time of press, anywhere within the Medina is 50 Dirhams. Don’t blow your top if you get hustled in the city. It will inevitably happen, over and over again. It ’s pretty much a sport among locals and it ’s amazing how even the most seasoned of travellers can fall for it. A common scam is to tell you that the place that you’re headed to is closed, or an offer to take you on a tour. A f rm, polite, “No, thanks,” does wonders. Change your money into Moroccan Dirhams when you arrive in the country. The rate in the city is far more favourable than that back home. Don’t give up on Marrakech because of its rough-andreadiness – it ’s all part of the city’s charm. Have lunch and some freshly-brewed mint tea while dipping your feet in the Ourika river at Setti Fatma. It’s one of my favourite pastimes. Take a trip offroad in the High Atlas, in the areas around Al Haouz and Ouazgita, or Moulay Brahim and Asni for a real slice of Berber life. The sunset over the magnificent Lalla (lake) Takarhoust. It really is a magical sight on a clear day. Just watch out for the low-flying, amateur paragliders.